There are various types of pressure cookers on the market and choosing the right one to purchase can feel stressful. Why should you consider a nonstick pressure cooker? A nonstick pressure cooker is easier to clean than other types of pressure cookers. Many people may feel they have to sacrifice durability for a nonstick pressure cooker, but this is not the case. A high quality, nonstick pressure cooker will be just as durable as stainless steel or aluminum. The Slow Cooker and Canner made by Power Pressure Cooker XL comes with many features for an all-inclusive pressure cooker. It is a pressure cooker, slow cooker, canner, soup maker, steamer, cookware, and rice cooker all-in-one. The exterior of the pot is made out of stainless steel while the interior is nonstick for easier clean-up. The one-touch, pre-set buttons include options for setting delay timer, canning/preserving, soup/stew, slow cook, rice/risotto, beans/lentils, fish/vegetable steam, chicken/meat, and a keep warm option. The steam release valve adds a measure of safety alongside the lid locking system. Click here to check the prices for the Power Pressure Cooker XL Steam Slow Cooker and Canner. The Gourmia GPC625 Smart Pot Pressure Cooker has multiple functions that can replace other common appliances. The cooking functions include soup, meat, poultry, steam, sauté, slow cook, dessert, beans, porridge, and rice. The cooker has a 24-hour programmable delay timer so that meals can be prepared in advance. The cooker has a precise thermostat that will automatically regulate the pressure and temperature inside the pot for optimum results. The exterior is made of stainless steel for durability while the removable, interior pot and cooking rack is nonstick for easier clean-up. Click here for the price of the Gourmia GPC625 Smart Pot Pressure Cooker. The Bilaca Nonstick Pressure Cooker is newer to the market, coming out in 2018. 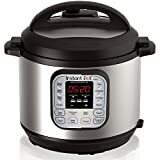 The 9-in-1 pressure cooker can operate as a pressure cooker, slow cooker, rice cooker, soup maker, steamer, yogurt maker, sauté, warmer, and make stew. The cooker includes functions such as a 24-hour timed start and time selection. These allow you to schedule and prepare your meals in advance. Click here to see the price of the Bilaca Nonstick Pressure Cooker. This six-quart pressure cooker is easier for a less tech-savvy person to use and was created by collaborating with American celebrity chef, Emeril Lagasse. Six functions include high pressure, low pressure, browning, sauté, simmer, and keep warm. The LCD will countdown how much time until the pot is under pressure and then count how much time remains. The cooker will automatically enter a standby mode when cooking is complete. The lid has an airtight seal for safety and optimum food results. The lid cannot be opened until all the pressure has been released. The nonstick cooking pot is removable and dishwasher safe, as is the steamer basket the pressure cooker comes with. This pressure cooker can braise meat, cook seafood, make dessert, and more. Click here to check out the price for the Emeril by T-Fal CT4000 Electric Pressure Cooker. The small details about a pressure cooker and its features are what will make or break your decision to buy it. It is important to not rush through the buying process so that you get the right one for you the first time around. Buying a nonstick pressure cooker online also allows you to search different sites to read all the reviews so you can make a well-informed decision before spending your money. Nonstick pressure cookers are currently less popular than other types but are still easy to find with an online search. The best nonstick pressure cooker will save you time and energy when preparing, cooking, and cleaning up a healthy, delicious meal.